Prior research demonstrates that rates of child maltreatment in military families rise and fall along with deployment cycles, and that the investigation of child abuse and neglect operates differently for military and civilian families. The Department of Defense created an extra layer of support for children in military families – recognizing their unique needs related to the stress of deployment and frequent moves around the country – by establishing its own child and family services program in 1981, the Family Advocacy Program (FAP). However, for the Department of Defense to appropriately deploy resources to FAP to help military families in need, we need a better understanding of risk factors that relate to instances of abuse including the impact of deployment, the specific personnel at greatest risk and any barriers to comprehensive reporting of instances of abuse and neglect to FAP. 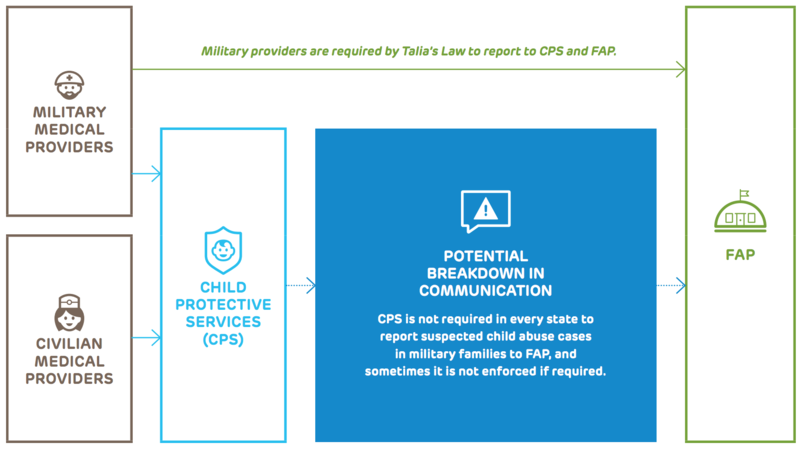 Several barriers can prevent medical providers’ diagnoses of suspected child abuse and neglect in military families from reaching the military's welfare agency, the Family Advocacy Program (FAP), even when providers make reports according to existing hospital protocol and state laws. In order to fully understand instances of child abuse in the U.S. Army and how they are reported, this project has undertaken the largest linkage of Army deployment and health care databases to date. Our aim is to uncover both the magnitude of child-abuse related injuries to children of Army soldiers and to identify the “high-risk” periods and soldiers upon whom to focus prevention efforts and family services. This project uses both a quantitative and qualitative approach to better appreciate the challenges faced by military families, as well as potential strategies that will support them and thereby reduce the risk for intrafamilial violence that may be associated with deployment. Children two-years-old and younger of Army soldiers deployed once were at increased risk for abuse and neglect during the six months immediately following their parent’s return. Even though the solider did not necessarily perpetrate the abuse or neglect, children whose dad was the soldier were at greatest risk following deployment, while children whose mom was the soldier were at greatest risk immediately prior to deployment. A child whose parent was diagnosed with a mental health condition was at an overall increased risk of maltreatment throughout the deployment cycle. However, they were at greatest risk in the months immediately prior to and following deployment. For children of soldiers deployed twice, their risk of abuse and neglect may rise during the second deployment. Another study, published in December 2016, uncovered that only 20 percent of medically diagnosed child abuse and neglect cases in Army dependent children between 2004 and 2007 were found to have a substantiated report with Army FAP. This rate is less than half of the rate (44 percent) of medically diagnosed child abuse cases substantiated by civilian Child Protective Services, which raises questions about years of reports from the Army stating that rates of child abuse are lower among their families than in the civilian population. Ultimately, the study’s findings suggest that the military has an incomplete picture of child abuse and neglect cases among Army families, and that some Army children may not be receiving the interventions they need. The team is currently working to update and expand on prior findings. Our future work will examine whether changes in Army policy have improved the practice of reporting medically diagnosed child maltreatment to FAP in recent years. We also hope to more fully understand why cases of medically diagnosed child maltreatment are not reported to FAP, and how the civilian Child Protective Services system can more efficiently collaborate with FAP. The goal of this study is to work with the Army leadership to develop streamlined recommendations of how to prevent child maltreatment, as well as how to effectively provide resources to families when it does occur. The team meets regularly with leadership within the U.S. Army Medical Research and Material Command as well as a growing list of stakeholders throughout the Army. Children's Hospital of Philadelphia, PolicyLab. Identifying Opportunities to Address Child Abuse and Neglect in U.S. Army Families [Online]. Available at: http://www.policylab.chop.edu[Accessed: plug in date accessed here].